This anthology brings together core classical texts for understanding literature. The selections from Plato illustrate the poetic philosopher's surprising exclusion of poets from his ideal republic. In his response, Poetics, Aristotle draws on the works of the great Greek playwrights to defend the value of the art. Horace's The Art of Poetry is a vivid practitioner's guide that promotes a style of poetic craftsmanship rooted in wisdom, ethical insight, and decorum. Longinus's On the Sublime explores the nature of inspiration in poetry and prose. 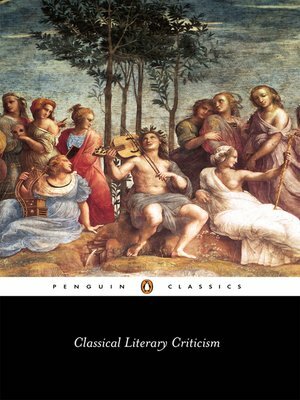 This volume is a work of great value and interest to classicists, students, and writers. In her Introduction, Penelope Murray compares and contrasts the viewpoints of these formidable critics as well as their impact on the Western tradition. This edition also includes a new bibliography and chronology and comprehensive notes to each of the texts.